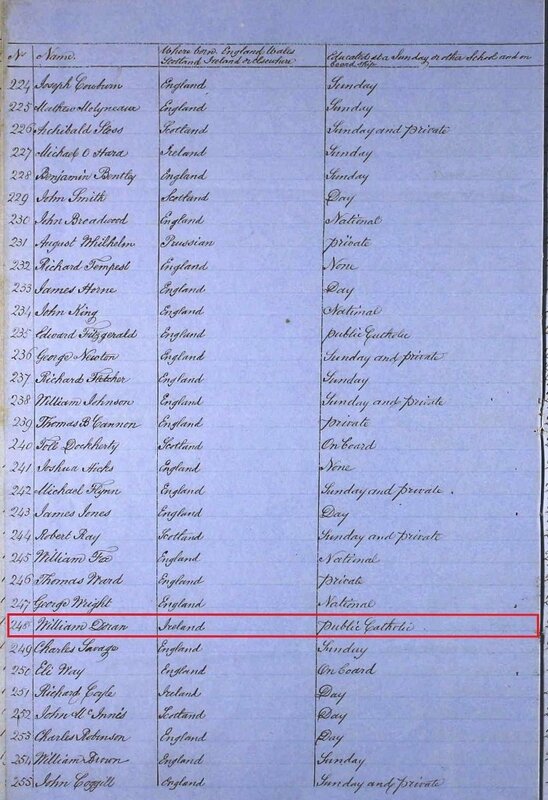 Birth date and place c. 1837 Ireland [MT32-2-24 TNA]. 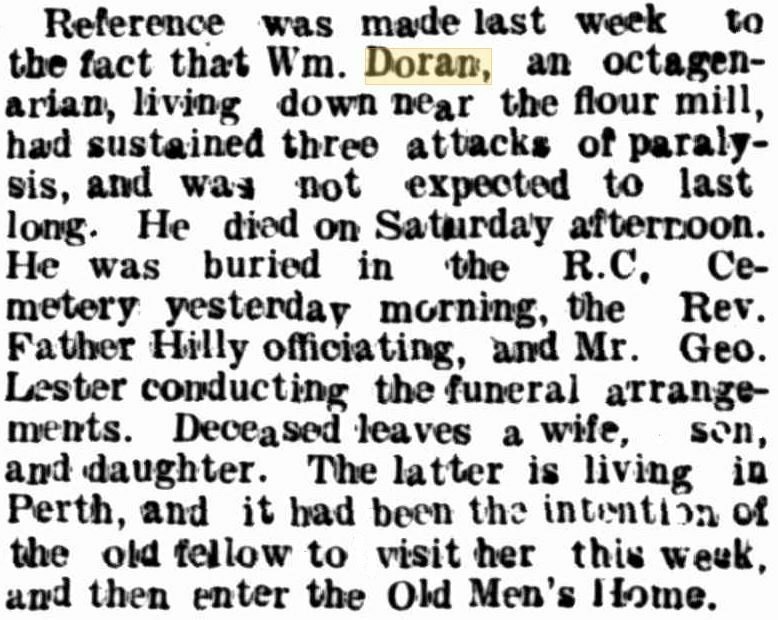 Note: his father, William Doran, was residing in Sligo, Ireland in Nov 1859-Jul 1860 [PCom2-42-9569]. Physical Description Height: 5 ft. 4 ins. Complexion: freckled. Eyes: hazel. Hair: sandy. Face: oval. Build: middling stout. Marriage date and place 1909 Geraldton, Western Australia. Children William Padbury b. 1889 Greenough, Western Australia (registered as Doran). Charlotte Mary Padbury b. 1890 (d.1891) Upper Irwin, Western Australia (registered as Doran). Rose Ann b. 1892 (d.1897) Upper Irwin, Western Australia (registered as Doran and Padbury). Elizabeth Maude b. 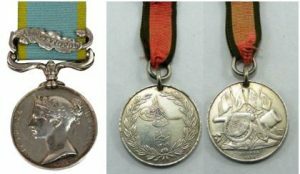 1894 Yandenghar, Western Australia (registered as Padbury). Annie b. 1897 (d. 1897) Yalgoo, Western Australia (registered as Doran). Death date and place 18 Jun 1910 Geraldton, Western Australia. Burial date and place 19 Jun 1910 Roman Catholic Cemetery, Geraldton, Western Australia. Death Notices and Obituaries Geraldton Guardian 18 Jun 1910. Geraldton Express 20 Jun 1910. Regiment No. and Rank #4103. 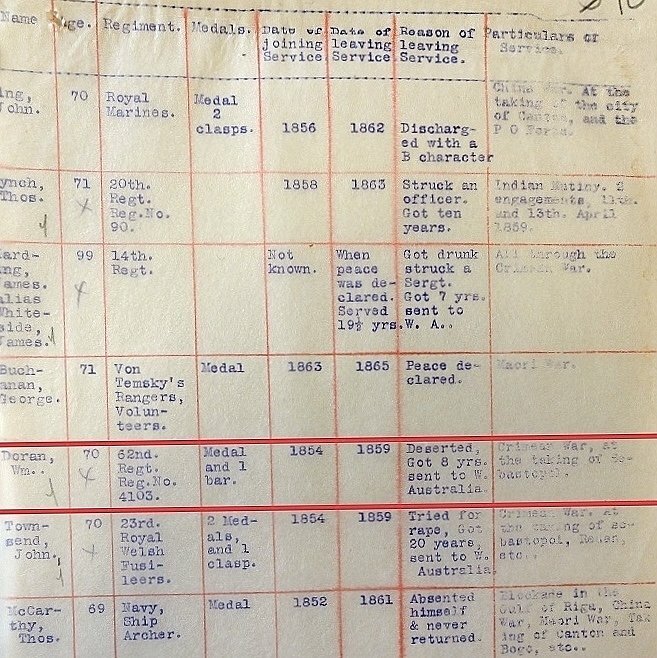 Attestation date and place 1854. Regimental Courts Martial One conviction, details unknown [PCom2-42-9569]. 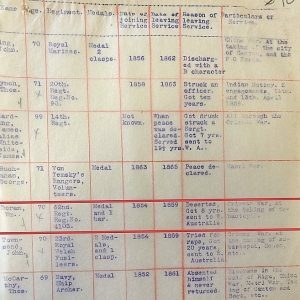 General Courts Martial Halifax, Nova Scotia [WO90-3]. Trial: 20 Jun 1859. Desertion. Prison and Register # Halifax 3 months. On board ship Himalyia 47 days. 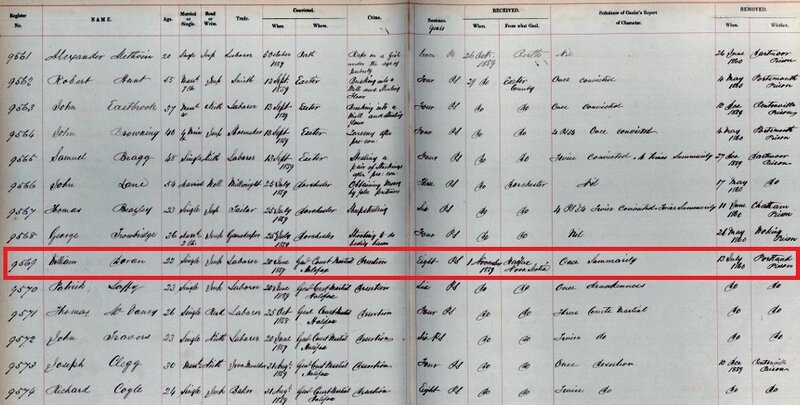 1 Nov 1859 to 13 Jul 1860 Millbank Prison #9569, 8 months 12 days.[PCom2-42-9569]. 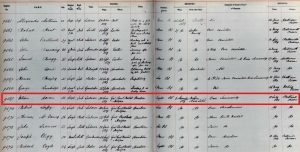 13 Jul 1860 to 23 Sep 1861 Portland Prison #9898 [PCom2-388-9898]. 23 Sep 1861 to 28 Jan 1862 Convict Ship Lincelles #248, 115 days passage from Portland [MT32-2-24]. Fremantle Prison 28 Jan 1862 #6176. 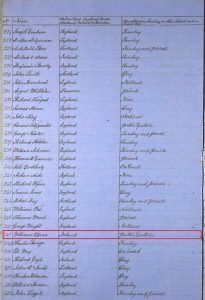 Parchment Certificate issued 4 Nov 1859 in Millbank Prison. 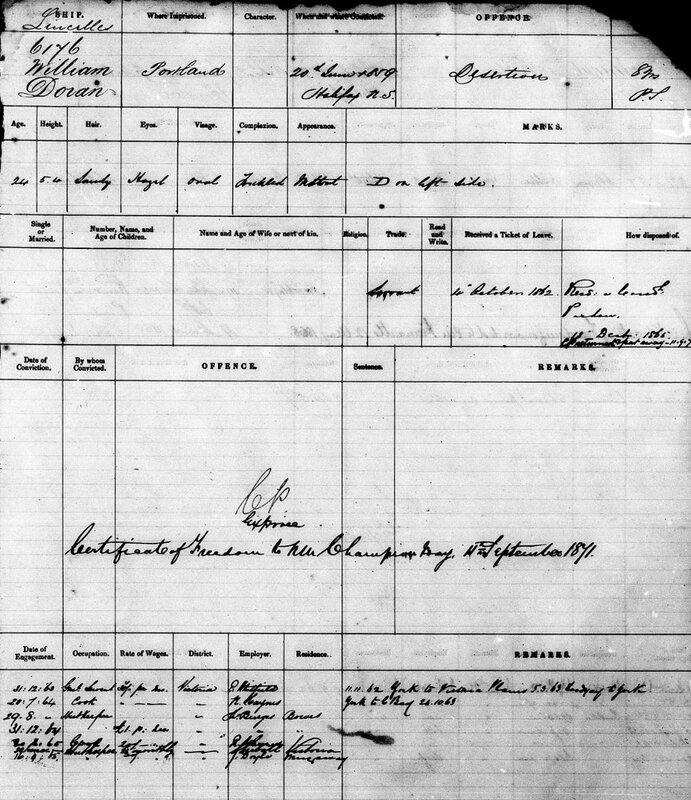 WA Ticket of Leave 4 Oct 1862. WA Certificate of Freedom 11 Sep 1871. WA Conditional Pardon 18 Dec 1865 Champion Bay. Other Documents Correspondence [Cons 652-1247-1909 WA SRO] relating to marriage to Annie Padbury. Misc. Newspaper Articles Geraldton Express 19 May 1909. Assault on William Doran by a Cingelese. Geraldton Express 15 Jun 1910. Report on William Doran’s strokes.